*Soaking time depends on the size and thickness of the mushrooms. Thinner sliced would normally takes 20-30minutes to rehydrate, thicker or whole cap mushrooms tend to takes longer. 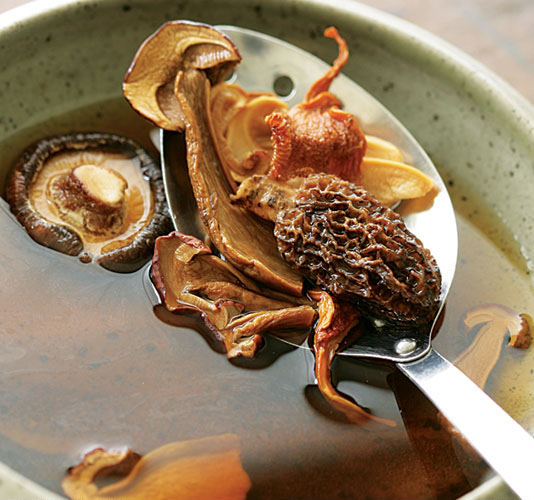 *If you're in a hurry, use warm or hot water to soak your mushrooms. Your mushrooms will soften more quickly, but more of their flavour will be extracted into the soaking water. 1. Soak them in room temperature water for at least 20 minutes. 2. The mushroom should increase in size and soften. Wash them by rinsing water to make sure the grits is completely removed. Even a bit of grits would spoil your food tasting experience. After making sure they are clean, gently squeeze them to remove excessive water. 3. It shall be prepared just like the fresh mushrooms now. Cut them in sliced or pieces and use them in steamboat, soups, stews, sauces, pastes, and gratins for extra flavouring. Grill or fried to use them in preparing your dishes. 4. Don’t throw away the flavourful soaking water! Use strainer such as coffee filter or paper towel to filter out the grits in soaking water, the water can be use as broth. Store it in a covered container in the refrigerator for several days or freeze it for even longer.